Lee Kaplan of DAFKA, StopTheISM and author of several articles on FrontPageMagazine wrote me and asked me to post about the real circumstances under which Rachel Corrie died. 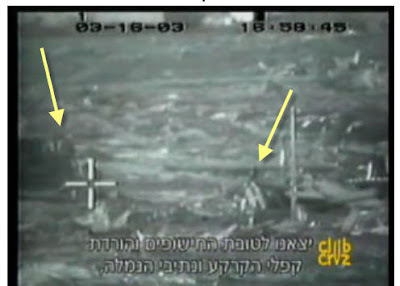 In the three videos below, Lee Kaplan, along with Becky Johnson, discuss the real circumstances surrounding the death of ISM anarchist Rachel Corrie in March of 2003 when she knelt in front of an Israeli bulldozer being a human shield while it was clearing suspected weapons smuggling tunnels in Gaza - and NOT a terrorist's house, which is what the ISM tried to pitch to the international community to garner support for their terrorist-loving cause. These three videos (each one approx. 9 minutes long) include doctored photos from ISM (see above doctored photo-chopped photograph from the ISM site) The ISM released those photos on their own website maintaining they showed Corrie with a bullhorn confronting the bulldozer that killed her, then moments later after being struck. However, a careful examination of the photos showed that scenes were staged with different tractors and at different times. 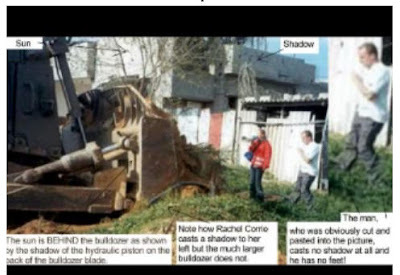 One photo with a superimposed tractor in the foreground and Corrie superimposed with another ISM activist in front of a "doctor's house," when enlarged, not only revealed the superimposition techniques, but that the ISM (or PLO photographers who doctored the photos) left off the feet of the two ISM activists. These are compelling videos which demonstrate the caluminous nature of the terrorist-loving International Solidarity Movement. A big thank you to Lee Kaplan for going to Israel and obtaining the film from the IDF. For more information on the ISM, visit DAFKA and StopTheISM.